You can use a pizza peel to flip your dough to the other side, or use tongs if your dough is small enough. In the image above, you can see that this is an extra large pizza. Some people prefer to make “personal pan” pizzas, especially when barbecuing with friends or kids where everyone wants different toppings. 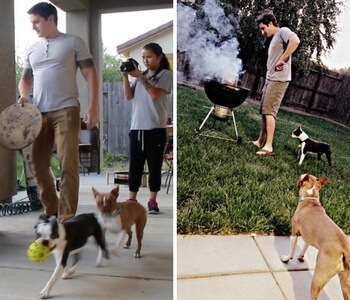 Grilling on both sides is essential. This will ensure that your dough is cooked all the way through. There's nothing worse than biting into a pizza where the middle is still soft and stringy like uncooked dough. So cook one side, flip it, then add toppings and cook until finished. The downside to this method is that your grill will only reach about 500ºF max. This is not “true” pizza cooking temperature. Then, you run the risk of the dough sticking to the grill and making a huge mess. The texture of the dough may not be to your liking as well, since you will get some grill lines in your dough! However, for many people and many events, this is good enough, especially since it doesn't require that you buy any equipment! If you want to spend a little bit of money (but not much), you can make a more traditional looking pizza with the purchase of grill-approved pizza stone. Not all pizza stones are made for the grill environment! Direct heat or flames may crack regular stones meant for baking in the oven! With a pizza stone for your grill, you can take some simple steps to mimic a brick pizza oven environment. With a 3 burner grill, remove the side grates so you have just one in the middle. Actually, my grill only has two grates, so I just removed one, and moved the other one to the middle. This helps the hot air flow to the top of the pizza so it cooks evenly on all sides. Once you achieve your pizza cooking temperature in your gas grill (400º-500ºF), you can test your stone to make sure it's hot enough. Toss some beads of water on top. If they roll around, then your stone is read to cook! Use a pizza peel to transfer your pizza to the stone. Cook for 5-10 minutes depending on your cooking temperature. Again, this won't reach proper pizza cooking temperature of 700º-1000ºF like wood-fired brick ovens, but you'll still get a really good pizza. Plus, you won't have those grill marks or have to worry about losing dough through the barbecue grates. With a stone you can cook that thin crust or deep dish style pizza (with a proper pan for deep dish of course). 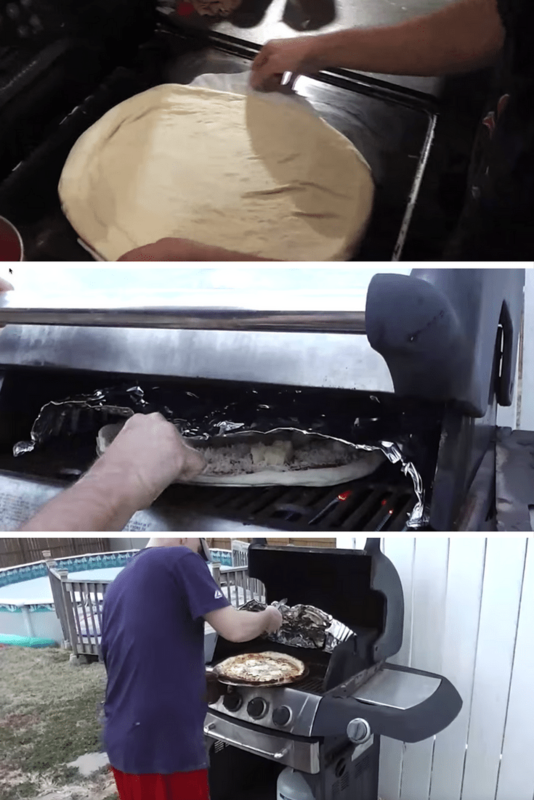 This is another great way to turn your gas grill into a pizza oven for cheap – and this time, you'll get something close to the proper pizza temperatures! It turns out that if you reduce the head space above the grill, you can heat that space up very quickly and very high. I'm sure this has to do with the fact that you now have an insulated pocket of super hot air between the ambient outside temperature and your “pizza making” area beneath the foil. Depending on the size of foil you have in the house, it may take a bit of craft-making skills to fold a little cap for your grill. Below is an example of how most people do it. This particular person used a regular pizza pan for oven use and lined it with parchment paper. I've also seen other people use this type of pan with nonstick spray or olive oil. Using this method, you should definitely turn the pizza a few times. It will cook in 5-10 minutes, but the temperature will get around 700º if you have your burners on high. The back of the grill will be much hotter than the front, so to prevent burning, turning is recommended! You can see from the photo that this pizza got a bit burnt around the edges. Personally, I don't mind it, but many people do. Oh, and make sure you have oven mitts and tongs so you don't burn yourself! 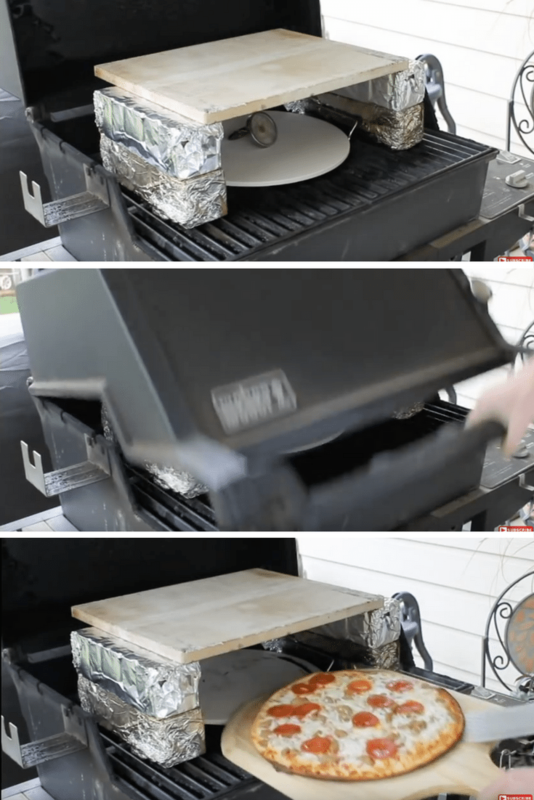 The downside to this method is that you have to make the foil cover yourself, and it cant take a bit of practice and planning to get it the right shape/size to fit your grill, as well as fit a pizza underneath it. Plus, you don't want it too big or it won't get hot enough inside! Even then, turning the pizza may be a bit of a chore. If you lift the foil you lose all that built-up heat. Combining this method with a pizza stone and pizza peel may be a bit difficult, and using a pizza peel is part of the fun of grilling pizza in the backyard! This is definitely some redneck ingenuity going on here. This is literally a brick oven. It's an oven, made of bricks, that's on top of a gas grill. You could use fire bricks, or just regular bricks covered in foil as this pizza maker has done. He's also use a pizza stone on top and bottom for an “authentic” pizza environment. Unfortunately, using bricks doesn't make the pizza taste any better or worse. And the way this oven is set up, I'm not convinced that it gets much hotter inside the structure than outside. He mentions in the video that the temperature reaches about 500º, but that's pretty much what a grill can do on its own. Still, it's fun to play with it. Perhaps with some bricks in the back and only stacking them one high (instead of two), you could get a higher temperature under the hood. This will make a pizza, for sure, but you'd probably be better off doing method 2 above, and just getting the pizza stone for your gas grill, without the extra bricks. A much more functional version of what was constructed above is actually available to buy online, and it's not that expensive. The company BakerStone, created a fully-enclosed box made of pizza stone. Equipped with a temperature gauge on the top, and carbon steel supports on bottom, you can put the Pizza Oven Box on top of your gas grill and get a temperature of 750º or more. It fits perfectly on a 3-burner gas grill, which is a pretty standard size, so most people will be able to use this device on their own grill, no matter the brand. The cool thing about this pizza oven box is that you get a more authentic pizza-making environment without investing a ton of money into a full wood-fired pizza oven for your backyard. People hype up the “wood fired” part because it sounds cool, but when you're cooking at 700-1000 degrees F as commercial pizza ovens do, you simply don't get any “wood” flavor to your pizza. 60 seconds is not enough time to impart any flavor! 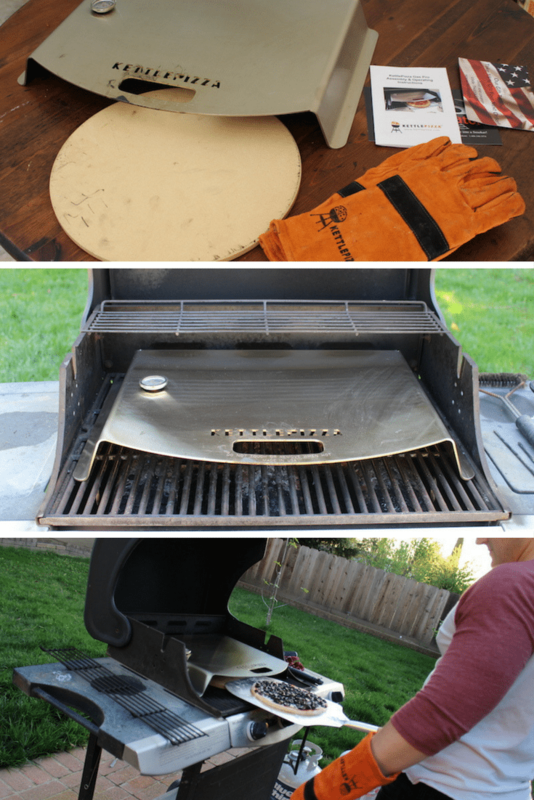 So this is a pretty legit pizza oven for your backyard, and it fits right inside your current grill. I've done a full-length review you can check out for more details, or you can buy it from Amazon. 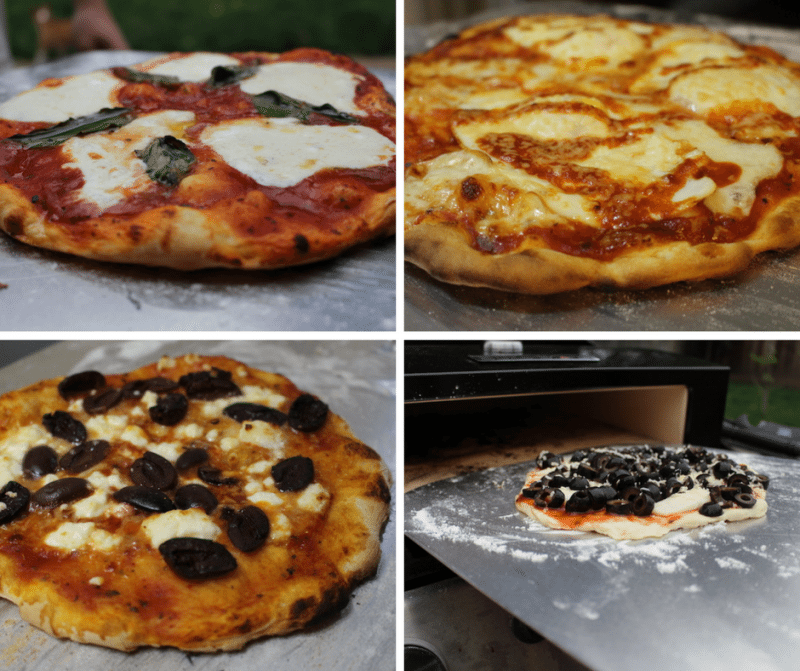 Below are some of the pizzas that I've personally cooked on my gas grill (shown above). As you can see, you don't need a fancy new grill to get amazing tasting pizza. My favorite invention was the sriracha fried egg pizza! Yeah, I like those weird artisan pizzas. 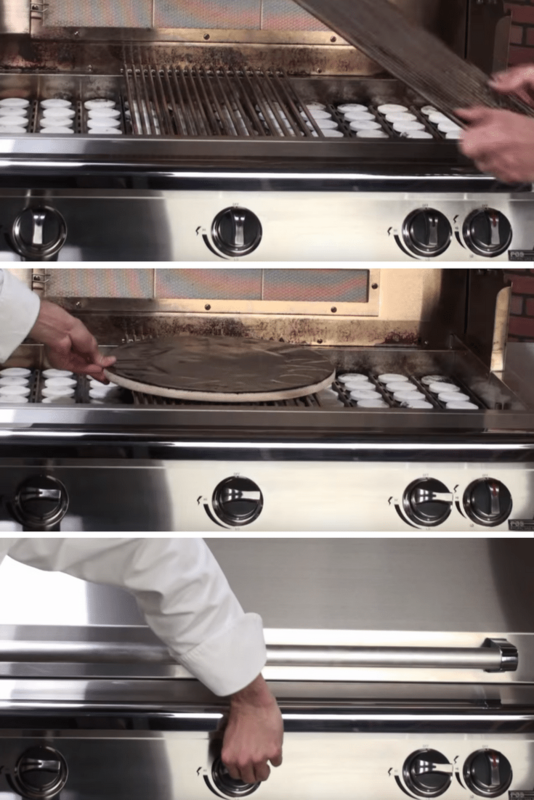 This is another very cool device that's specifically designed to make pizzas on a gas grill. KettlePizza actually started out with a device to make pizzas on Weber charcoal kettle grills, hence the name KettlePizza. However, they recently released their Gas Pro version, made for gas grills. You can see it below. It fits perfectly on a 3 burner grill! Actually, it looks quite like the foil method above, right? Except this is not made out of flimsy aluminum. Quite the opposite. It's a very thick, very sturdy, single piece of solid stainless steel. There's two holes in the device. One is for the temperature gauge, and one is the handle for transporting it. You can check out my review of KettlePizza Gas Pro, or get it from Amazon. You can also get it from KettlePizza.com for more package options. Some packages come with a pizza stone (required) and a pizza peel (required). I actually prefer this one to the BakerStone Pizza Box because it heats up faster, and gets hotter. Because you can close the grill with this one, you can get the temperature up to 700º or more in 10-20 minutes. It's fast! Plus, because you can get it piping hot in there, your pizza will cook in just 2-4 minutes, getting the true artisan pizza flavor. I'm not sure about why that happens, but all the videos I saw on YouTube implied that faster cooking meant better texture for your pizza crust. 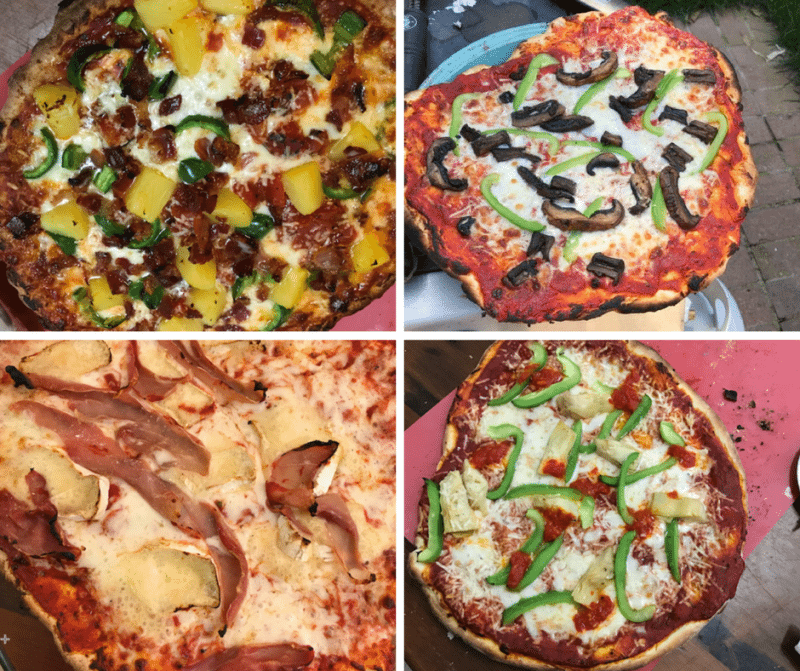 Below are some pizzas I made with the KettlePizza Gas. A couple got burnt on the edges because I was still learning how to use this thing properly. My favorite was the jalapeño, bacon, pineapple pizza on the top right. I tend to like spicy pizzas. The downside to KettlePizza Gas is the cost. It's more expensive than BakerStone, plus, you need a pizza peel and pizza stone. You can get those as part of a package deal, but still, it's a bit pricey. Which of these methods are you going to try? Or do you have an alternative method to share? In my research for this post I was surprised to find how common it was to grill pizza on a gas barbecue. I saw everyone from seasoned grillin' dads, to stay-at-home moms, to kids making their pizzas in the backyard like this. 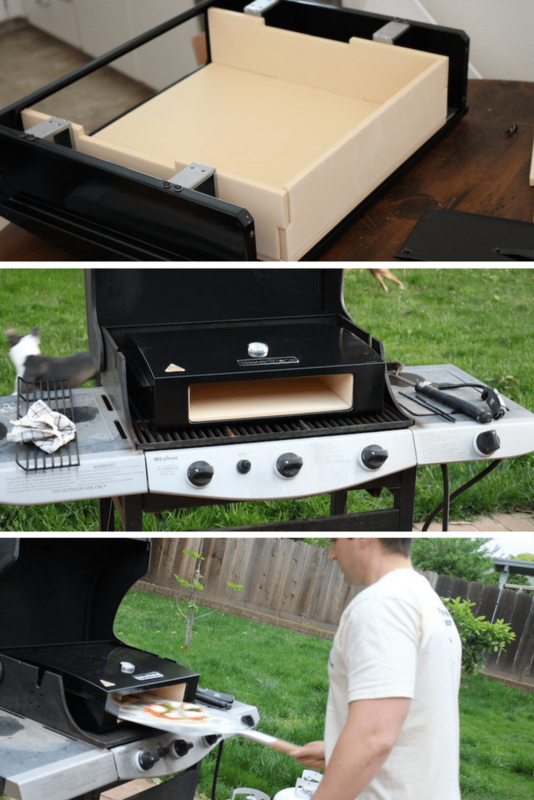 I still want to get a portable grill and make some pizzas while camping or tailgating! Amazing ! Amazing ! 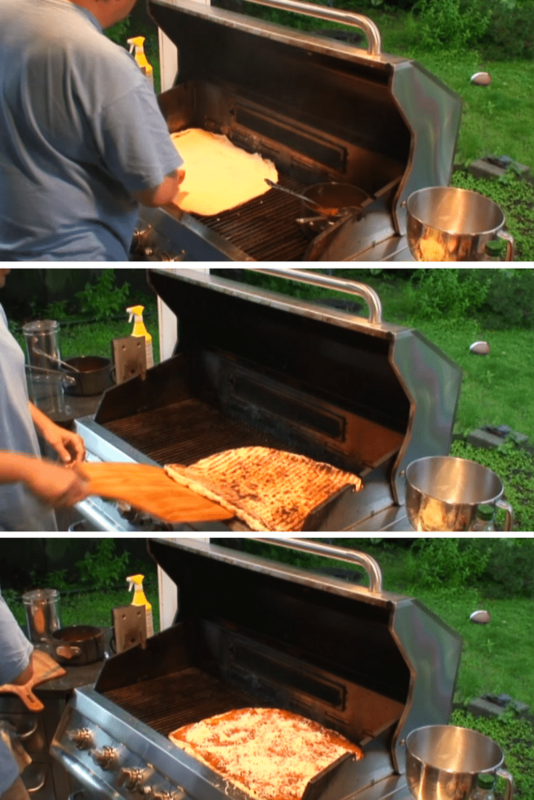 I just never thought of using gas grill like this, , although I just love Pizza, but most of the times I used to order it from outside as I never thought of using grill for making pizza. By the way, How’s the taste, Is it like the pizza cooked in normal oven or we get that special grilling taste in Pizza? I think it tastes better. Is it placebo? Maybe. It’s more fun. Can’t help but feel like it tastes better. But it cooks a lot faster too, so I think that helps get a nice crispy thin crust with a chewy center. To me, oven pizza is always a little floppy. Good, but not as good as the pizza you get with a pizza stone at 800º!